Bank of India has released notification for General Banking Officers and Credit officers recruitment 2017. The important fact here is - For Manager Scale II maximum age limit is 35 years. Read the details about notification here. There is no sectional timing. I recommend you to read "The Hindu" every day. Along with newspaper, I recommend you to download my free notes here. 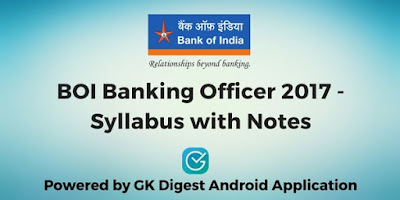 Install BankExamsToday Android Application for GK section of BOI Specialist Officers exam.